Father Christopher House, Director of Vocations for the Diocese of Springfield in Illinois, says that he has a problem with his group of eleven seminarians. In his words, the group "is too small!" In the Aug. 1 edition of Catholic Times Bishop Thomas John Paprocki spoke of the trip that he and I made to Ss. Cyril and Methodius Seminary in Orchard Lake, Mich. The seminary there specializes in pairing seminarians from Poland with dioceses here in the United States where they might serve as priests. The bishop and I are planning to return in September to Ss. Cyril and Methodius to meet the new class of seminarians there and invite them to consider priesthood in our diocese [I am very hopeful for this. The Poles at the seminary with me were men of strong faith and good humor]. This is a great opportunity for our diocese, however, it is not a fix for our priestly vocations need. Currently we have 11 very fine men in the seminary system studying on behalf of our diocese. I am proud of these men and I can tell you that we are blessed to have them. I have only one problem with this group: It is too small! There is no reason why our diocese should not be sponsoring 20-plus men [He's right, you know]. They are out there. We need to find them. This is where your help is needed [Finding them isn't as hard as you might think. You see them everyday. Just ask them if they've consider the priesthood yet. I daresay you'll be surprised at the responses you'll get]. What can you do to help change this situation? Lots! First, pray; it’s that simple. We do not need to ask that God will bless us with more priestly vocations; he is already planting those vocations in the hearts of men throughout the diocese. Our prayer needs to be that those who are called might respond joyfully and without fear [Father makes an excellent distinction here]. It is our responsibility to help bring those vocations forward; praying for those who are called will help them to speak that “yes” to the Lord’s call. Second, invite! Look around your family, your friends, your parish; is there someone there who might just possibly make a good priest? Have you ever considered asking him? All it may take is a simple invitation to open someone’s mind and heart to the Lord’s call [That invitation from others was what I needed]. Maybe you are someone whom the Lord is calling; have you ever considered it? [The Lord isn't always calling the other guy]. Over the next months the Office for Vocations will make some new initiatives in the hopes of helping more men in our diocese to say “yes” to the call to share in the priesthood of Jesus Christ. Vocations are everyone’s business. Are you doing something to help others answer the call? Dr. Alveda King, pro-life proponent and niece of the late civil rights leader, Dr. Martin Luther King, will join Bishop Thomas John Paprocki at an ecumenical prayer service for life at 1 p.m. Friday, Sept. 24, at the Cathedral of the Immaculate Conception. The service will be followed by a prayerful walk and peaceful protest at the Planned Parenthood of Springfield. The events are sponsored by the diocesan Office for Social Concerns, the Gospel of Life Committee of Blessed Sacrament Parish in Springfield, and Springfield Right to Life. In March of this year, Planned Parenthood announced that it would begin offering medication abortions at the Springfield offices, located 1000 E. Washington St. Medication abortions involve pills containing the drug mifepristone (formerly called RU-486), which the pregnant woman takes at the Planned Parenthood office. She is then given medication call misoprostol, which she takes at home. Within 24 to 48 hours, the baby is aborted. "Our presence and prayers outside Planned Parenthood are a witness to the respect of all life, especially the unborn baby," said Sister Jane Boos, SSND, director of the Office for Social Concerns. "We pray that mothers and fathers, struggling with a difficult pregnancy, will choose to give their unborn child life and that the community of faith will be there to help that woman financially, emotionally and spiritually during the pregnancy. In addition, we protest the introduction of the abortion drug RU-486 in our community." Sister Jane said that Springfield area Catholic schools have been invited to send student representatives to the prayer service and peaceful protest. King, who sees the pro-life struggle as a continuation of the civil rights struggle, currently serves as a pastoral associate and director of African-American outreach for Priests for Life and Gospel of Life Ministries. She is also a voice for the Silent No More Awareness Campaign, sharing her testimony of two abortions, God's forgiveness and healing. King is the daughter of the late civil rights activist Rev. A.D. King and his wife, Naomi Barber King. She grew up in the civil rights movement led by her uncle. Her family home in Birmingham, Ala., was bombed, as was her father's church office in Louisville, Ky. She was jailed during the open housing movement. King is a former college professor, served in the Georgia State House of Representatives and sits on the board of Georgia Right to Life. On that same evening of Sept. 24, King will be the keynote speaker for Springfield Right to Life's annual benefit dinner at the Northfield Center, 3280 Northfield Drive in Springfield. Tickets are $50 per person for adults and $25 each for students. The reception will begin with hors d'oeuvres at 6:30 p.m. Dinner will be served at 7 p.m. with Bishop Paprocki giving the invocation. Included in the festivities will be presentation of the Msgr. John Spreen awards for 2010. The winners are: Congressman John Shimkus, the Statesman Award; Alveda King, the Warrior Award; and Angie Squires, the Rosebud Award. Tickets for the benefit dinner are $50 per person for adults and $25 each for students. Reservations for the dinner may be made by check to Springfield Right to Life, 316 E. Monroe St., Springfield IL 62701. Or, visit www.srtl.org. For information about the ecumenical prayer service and peaceful protest at the Planned Parenthood offices, contact Sister Jane Boos at (217) 698-8500. From my experience of but five years as a priest, he is quite right. Go read the full text. The Holy Father Benedict XVI has honored twenty priests of the Archdiocese of Chicago, thirteen with the title "Prelates of Honor to His Holiness" and seven priests with the title "Chaplains to His Holiness." Both sets of honors come with the honorary title "Monsignor." Some of those honored were professors under whom I studied at Mundelein Seminary: the Reverend Monsignors John V. Dolciamore, Dennis J. Lyle (who is now rector of Mundelein Seminary) and Charles R. Meyer. 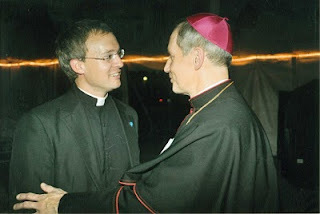 The Reverend Monsignor John F. Canary was the rector of Mundelein Seminary during my time there; currently he is the Vicar General. The Most Reverend Thomas J. Paprocki, Bishop of Springfield in Illinois, will run his seventeenth marathon this October in Denver Colorado. As you may already know, I enjoy running and over the years have participated in 16 marathons. I am currently training to run the 26.2 mile Denver marathon on Oct. 17, 2010. One of the reasons I run marathons is to raise funds for charity. This year I have decided to dedicate my marathon effort to help pay off the debt of the recent restoration of the Cathedral of the Immaculate Conception in Springfield. Many people who attended my installation as your new bishop in June made very favorable comments about the newly-restored Cathedral. Catholics in the Diocese of Springfield in Illinois can take rightful pride in our beautiful mother church, especially the many people who have already contributed generously to help pay the restoration costs. However, due to unexpected expenses there is an outstanding debt of $2.07 million. I would like to make a push to retire this debt completely. If you have any prayer intentions that you would like me to include while I am running and praying, please write them down and return them to me. As sacred Scripture says, "Let us run with endurance the race that is set before us" (Hebrews 12:1). Your support will be greatly appreciated by me and all Catholics who gather and pray at our magnificent Cathedral. If you wish to make a pledge, you may do so online or through the mail. This morning I happened to see on Facebook that one of my former students has launched a blog, Lux Mundi, through which he hopes to "spread the Light, that light being the truth of the Catholic Faith." The city in which I was working for the work [sic; read "week"] has been known as a seedbed for vocations for our diocese, and I see why. The families are amazing in building culture and faith amongst themselves. The priests seem to know how to get to the people. And the perpetual adoration chapels are numerous. When a city loves the Eucharist that much, as well as the man who helped bring it to them, there is no wonder why so many priests are born there. Though I do not know, I suspect he speaks of my beloved Quincy. If I am wrong, I am sure he will let me know. His third post is on diversity in the Church, and his fourth post is a fine reflection on bread. I think he's well on his way to spreading that light. Go ahead: add him to your blog reader. His Holiness Pope Benedict XVI used his General Audience address yesterday to encourage familiarity the Saints. In the life of each one of us there are very dear persons, to whom we feel particularly close; some are already in God's arms, others still share with us the journey of life: they are our parents, relatives, educators. They are persons to whom we have done good or from whom we have received good. They are persons we know we can count on. However, it is also important to have "travel companions" on the journey of our Christian life: I am thinking of a spiritual director, a confessor, persons with whom we can share the experience of faith, but I am also thinking of the Virgin Mary and of the saints. Each one should have a saint that is familiar to him, to whom he feels close with prayer and intercession, but also to imitate him or her. Hence, I would like to invite you to know the saints better, beginning with the one whose name you bear, by reading his life, his writings. You can be certain that they will become good guides to love the Lord ever more and valid aids for your human and Christian growth. As you know, I am also united in a special way to some saints: among these, in addition to St. Joseph and St. Benedict, whose names I bear, and of others, is St. Augustine, whom I had the great gift of knowing, so to speak, up close through study and prayer, and who has become a good "travel companion" in my life and my ministry. I would like to stress once again an important aspect of his human and Christian experience, timely also in our age, in which it seems that relativism is, paradoxically, the "truth" that must guide thought, decisions and behavior. St. Augustine was a man who never lived superficially. Thirst [for Truth], an anxious and constant search for Truth, is one of the underlying characteristics of his existence; however, [he didn't seek] "pseudo-truths" incapable of giving lasting peace of heart, but that Truth that gives meaning to existence and that is the "dwelling" in which the heart finds serenity and joy. His, we know, was not an easy journey: He thought he found Truth in prestige, in his career, in the possession of things, in the voices that promised him immediate happiness. He committed errors, went through sadness, faced failures, but he never paused, he was never satisfied with what gave him only a ray of light. He was able to look into the depth of himself and he realized, as he writes in his Confessions, that that Truth, that God that he was looking for with his efforts was more intimate to him than he was to himself. He had always been by his side, had never abandoned him, was waiting to be able to enter into his life definitively (cf. III, 6, 11; X, 27, 38). As I said commenting recently on a film on his life, in his anxious search, St. Augustine understood that it was not he who had found Truth, but that Truth itself, which is God, pursued and found him (cf. L'Osservatore Romano, Thursday, Sept. 4, 2009, p. 8). Commenting on a passage of the third chapter of the Confessions, Romano Guardini affirms: St. Augustine understood that God is glory that puts us on our knees, drink that extinguishes thirst, treasure that makes us happy, [...he had] the pacifying certainty of one who has finally understood, but also the blessedness of the love that knows: this is everything and it is enough for me" (Pensatori religiosi, Brescia, 2001, p. 177). Dear brothers and sisters, I would like to say to all, also to those in a difficult moment in their faith journey, those who do not participate much in the life of the Church, or those who live "as if God did not exist" that they not be afraid of the Truth, that they never interrupt their journey toward it, that they never cease to seek the profound truth about themselves and about things with the internal eyes of the heart. God will not fail to give Light so that one can see, and Warmth to feel the heart that loves us and that wants to be loved. May the intercession of the Virgin Mary, of St. Augustine and of St. Monica accompany us on this journey. In an interview with the Catholic New World, the Most Reverend Joseph Perry said what he needs now to advance the cause of canonization for Father Augustus Tolton is prayers: "Prayer and intercession that God will favor the church in Chicago — or will favor anyone with God’s intervention in their life through Tolton’s intercession." Bishop Perry, who recently returned from a meeting with the Congregation for the Causes of Saints, also reports that the cause is moving along. Mozlink passes on the sad news that those wishing to visit the settlement where Saint Damien of Moloka'i lived and worked for sixteen years cannot - at this time - take the famed Moloka'i Mule Rides down the pali trail into the former leper colony. The only way in is by plane. The question posed to Jesus by someone in the crowd is a poignant one: “Lord, will only a few people be saved” (Luke 13:23)? This person seeks to know the number of those who will be saved and, perhaps, even the names of those who will be saved. What, then, can one do to be saved? Salvation is, first of all, a gift of God; it is the gift of the forgiveness of sins and the restoration of God’s friendship. Saint Paul teaches us, “For by grace you have been saved through faith; and this is not your own doing, it is the gift of God” (Ephesians 2:8). Yet, though salvation is the gift of God, it can also be lost or even refused. The Apostle also instructs us, saying, “Therefore, my beloved, as you have always obeyed, so now, not only as in my presence but much more in my absence, work out your own salvation with fear and trembling; for God is at work in you, both to will and to work for his good pleasure” (Philippians 2:12-13). The gift of salvation, then, is not something that is simply received once as though it were though over and done. The Lord God “desires all men to be saved and to come to the knowledge of truth,” Jesus Christ, who died for us that we might be saved (I Timothy 2:4). Indeed, when the Lord Jesus walked among us, he called everyone to enter his kingdom, especially those who are sinners. So fundamental to his ministry is this call that in Saint Mark’s Gospel the first words spoken by Jesus are these: “The time is fulfilled, and the kingdom of God is at hand; repent, and believe in the Gospel” (Mark 1:15). Jesus invites us sinners “to that conversion without which one cannot enter the kingdom, but shows them in word and deed his Father’s boundless mercy for them and the vast ‘joy in heaven over one sinner who repents’ (Luke 15:7) [Catechism of the Catholic Church, 545].” This first conversion leads one to the waters of baptism, but we know that this conversion must also be ongoing until the very moment of death; each of us is constantly in need of conversion, of a greater turning towards the Lord. It is by this continual striving to enter through the narrow gate that we work out our salvation, being constantly “drawn and moved by grace to respond to the merciful love of God who loved us first” (cf. I John 4:10) [Catechism of the Catholic Church, 1429]. This is what Jesus means when he tells us to “strive to enter through the narrow gate.” In Paul’s language, we work out our salvation by the choices we make each day of our lives. He allows us to choose to live in his love or to reject his love. He honors and respects our freedom and will not force us to love or serve him; he will not force us into a friendship with himself. Even so, he continually offers his friendship to us. This is why he says there will be those whom he does not know who will say to him, “Lord, open the door for us” (Luke 13:25). The gate to salvation, to heaven, to friendship with Jesus, is narrow, because it is the way of love and of selflessness. Those who enter through the narrow gate are those who follow Christ Jesus and seek to imitate him in all things. Because salvation is found in the Truth, “those who obey the prompting of the Spirit of truth are already on the way of salvation;” they are preparing to enter through that narrow door. Likewise, those who disobey the Spirit of truth are not on the way of salvation but on the way of perdition [Catechism of the Catholic Church, 851]. “We cannot be united with God unless we freely choose to love him. But we cannot love God if we sin gravely against him, against our neighbor or against ourselves” [Catechism of the Catholic Church, 1033]. For this reason, Saint John writes, “He who does not love remains in death. Anyone who hates his brother is a murderer, and you know that no murderer has eternal life abiding in him” (I John 3:14-15). If we die in the state of mortal sin, that is, outside of friendship with God, we will be forever separated from him because of our free choice against him and against his will. This state, this eternal separation from God, “in whom alone man can possess the life and happiness for which he was created and for which he longs,” we call “hell,” where, in the words of the Savior, “there will be wailing and grinding of teeth when you see Abraham, Isaac, and Jacob and all the prophets in the kingdom of God and you yourselves cast out” (Luke 13:28) [Catechism of the Catholic Church, 1035]. To be cast out of the kingdom, it is necessary to willfully turn from God through mortal sin and persist in it until death, but those who find themselves in mortal sin can repent of their sin. They are invited to hear again the Lord’s invitation, “Repent, and believe in the gospel.” The Lord Jesus calls them to seek the grace of God through a sacramental confession, that they might be freed from their sins, restored to friendship with God and set again on the path to life. Notice what those who are not known by the Lord say to him: “We ate and drank in your company and you taught in our streets” (Luke 13:26). They are those who looked to Jesus for what he could give them; we might say they were simply along for the ride. They are those who heard his teachings and saw his acts of love but allowed neither to impact their lives or hearts; they refused to change their hearts and would not give themselves to Christ. Many have believed in Christ and have celebrated the holy festivals in his honor. Frequenting the churches, they also hear the doctrines of the gospel, but they remember absolutely nothing of the truths of the Scripture. With difficulty, they bring with them the practice of virtue, while their heart is quite bare of spiritual fruitfulness. These will also weep bitterly and grind their teeth, because the Lord will also deny them [Cyril of Alexandria, Commentary on Luke, Homily 99 in Ancient Christian Commentar on Scripture, New Testament Vol. III: Luke, Thomas C. Oden, et al, eds. (Downers Grove, Illinois: Inter Varsity Press, 2003), 230]. As we hear the word of the Lord we would do well to sincerely consider how well we know the Lord and how serious and purposeful is our prayer at the Holy Mass. Dear brothers and sisters, do we truly listen to the Word of God proclaimed in our midst and seek to interiorize it, or do we simply endure it? Do we truly prepare ourselves well before the Holy Mass by keeping the hour fast and turning our hearts to the Lord, or do we simply show up? Do we say our responses with conviction and sing to God with the heart of one who loves, or are we simply physically present? When we approach Holy Communion, do we know who it is that we are about to receive, or do we simply approach as mindless lemmings? Do we receive his Precious Body in our hands or on our tongue with devotion and humble love, or do we treat the Eucharistic Lord as just another token? You see that they did not value their food very highly, and yet it was with reference to it that they said they belonged to Christ. Christ is the food that is eaten and drunk. Even Christ’s enemies eat and drink him. The faithful know the Lamb without spot on which they feed, if only they fed on it in such a way that they are not liable to judgment! The apostle says, “Whoever eats and drinks unworthily is eating and drinking judgment upon himself (I Corinthians 11:29)” [Saint Augustine of Hippo, Sermon 308, A.6 in Ibid.]. Let us not be found as enemies of Christ, but as those counted among his friends. How, then, are we to receive the Body and Blood of the Lord in a worthy manner? We do so by preparing ourselves, both physically and spiritually, to receive Holy Communion. If we examine our consciences and find that we have not kept the hour fast, we should not approach the Sacrament. If we find that we have not quieted ourselves to receive, we might well consider not approaching the Sacrament. If we are conscious of serious sin we have committed which has not yet been confessed – if we have destroyed another’s reputation; if we have engaged in sexual activity outside of marriage; if we have used contraception or helped procure an abortion; if we have missed Mass on a Sunday or holy day – we should not present ourselves to receive Holy Communion. By receiving the Precious Body and Blood of the Lord when we are not in a state of grace, when we are outside of his friendship, we compound our sin with the sin of sacrilege. Friendship with Jesus requires a continual conversion of heart and mind. It requires that we listen to him in all things and seek to follow faithfully after him. It means that we live in communion with him and with his Church. In short, friendship with Jesus – like any friendship – is not possible without a conscious effort and desire to please him. Let each of us, then, seek to enter well into these holy mysteries celebrated at his altar, that we might know the Lord and be known by him. Amen. With respect to the past, the shift represented by the new course of the Church in the United States consists, on the terrain of politics, of abandoning the "Kennedy doctrine," the doctrine of a rigid separation between Church and state, the effect of which – according to its critics – is the privatization of religious belief in the isolation of the conscience and its elimination from the public sphere. Magister particularly notes that the Most Reverend Charles J. Chaput, Archbishop of Denver, has called Catholics to a certain "resistance" that is not just defensive, but - in Magister's word -proactive. From Zenit - and via Carl Olson - comes the happy news that the second volume of Pope Benedict XVI's series Jesus of Nazareth should be available March 13, the First Sunday of Lent. What is more, Ignatius Press will publish it. It struck me a bit funny that Ignatius Press didn't publish the first volume. Much of my duties these past few weeks have involved looking through papers, creating files and learning the lay of the land, as it were. As such, there hasn't been a great deal of interesting things to post about, unless you like hearing about filing systems, the joys of coordinating schedules and other such things. Some want their marriage to be ideal and if there's any ordeal they want a new deal. Honey, if you ever leave me, I'm going with you. Marriage makes two people one. The trouble comes in determining which one. He eleborates each of these notions here. Do go have a read. Friday I received in the mail an envelope from the Bishop's office on which was stamped in red letters, "DO NOT BEND." One of my former students is now attending Southern Illinois University at Carbondale (Illinois) and has asked for my recommendation as to where he should attend Mass there. Not knowing the area I could not make a recommendation to him. It seems the city has both a Newman Center and St. Francis Xavier parish. Are you any of you good readers familiar with either? Would recommendation would you make? Let me ask you a question: Do you hear what I hear? Since the reintroduction of the bells at the epiclesis and consecration at St. Benedict church, many of expressed their appreciation for them and others have wondered why we have them (others have commented similarly at Sacred Heart in Virden and at St. Patrick’s in Girard). The General Instruction of the Roman Missal says, “A little before the consecration, when appropriate, a server rings a bell as a signal to the faithful. According to local custom, the server also rings the bell as the priest shows the host and then the chalice” (150). The option of ringing a bell at these three moments is an option I have chosen to utilize. The ringing of such bells has a two-fold reason: first, the bells “make a joyful noise to the Lord” (Psalm 98:4); second, the bells help to recall the attention of the faithful – if it has been lost – to the Eucharistic sacrifice at the moment when the bread and wine are changed into the Body and Blood of the Lord Jesus Christ. Some suggest that since the Holy Mass is now routinely celebrated entirely in the vernacular language – for us, English – that the use of such bells is no longer needed because people now can understand what happens during the Liturgy. If such were indeed the case, I daresay no one would ever get up to go the restroom during the consecration of the Precious Body and Blood of the Lord. The use of the bells help us to realize more clearly the great mystery of what takes place when the priest speaks the words of institution. The words spoken by the Lord Jesus in today’s Gospel should give us all pause for careful consideration: “I do not know where you are from. Depart from me, all you evildoers” (Luke 13:27)! Each of us would do well to consider prayerful our participation and attentiveness at the Holy Mass. The Second Vatican Council reminded us that “Mother Church earnestly desires that all the faithful should be led to that full, conscious, and active participation in liturgical celebrations which is demanded by the very nature of the liturgy, and to which the Christian faithful … have a right and obligation by reason of their baptism” (Sacrosanctum Concilium, 14). Such participation in the liturgy is both exterior and interior; indeed, the interior participation, an awareness of what happens during the Liturgy and a prayerful joining of ourselves to the prayer of the Mass, is necessary before all us. It is in the Holy Mass that the Lord Jesus Christ comes to meet us, to know us and be known by us. Let each of us seek to enter into the mystery celebrated at the altar of God, that at the end of our life the door may be opened for us because we have known the Lord and have followed his will for our lives. A blessed and joyous Sunday to you each one of you! At long last, it is announced today that the Holy See has approved the new English translation of the third typical edition of the Roman Missal - the book of prayers for the celebration of the Holy Mass - and that the new translation will be put into use the First Sunday of Advent 2011 (November 27, 2011). If happens often enough at funerals in every parish; it may be more noticeable at one funeral or another or in one parish or another, but still it happens, this great tragedy. The first hint of it comes as the family and friends of the deceased move into the pews and take their seats, as though some show were about to begin. The second hint comes when a simple motion for the congregation goes unheeded, necessitating a distracting and interruptive verbal instruction. The third hint comes when the congregation makes no response to the opening prayer, or to the readings. I celebrated such a funeral for a man yesterday - may he rest in preace - and my heart was deeply pained as I wondered how many sacriligous Communions would be made at that funeral by those who call themselves Catholic but who seemingly have not darkened the doors of a church in many years nor made a sacramental confession. Simply consider how very often this happens in our parishes! Both at funerals and at weddings, and perhaps even First Communions and Confirmations and graduations. We should all be moved to tears at such a deplorable situation. Where is the fear of God? Where the love of the Eucharistic Lord? The responses do not change, nor do the postures. Catholics who regularly attend the Holy Mass and who enter into it's prayer should not be dumbfounded at funerals or weddings. I cannot help now but wonder if when next I meet with a family prior to a funeral if I should not bluntly - and humbly - ask when the last time was that the family went to Mass. This would give me the opportunity to encourage them - and to ask them to encourage others among their family and friends - to make a sacramental confession prior to the funeral that they might worthily receive the Eucharist and not eat and drink condemnation upon themselves (cf. I Corinthians 11:27-32). This morning following Mass I had intended to drive to Effingham for a routine visit with my doctor, but found my joints were in no real shape for such a drive and back. Much to my surprise, an opening was available in the afternoon, which I happily took. The morning found me in my office finishing up a few things for the bulletins, writing letters and seeing to various other details. By the time I needed to leave for Effingham to keep my rescheduled appointment my joints were - thankfully - feeling better. My health remains generally decent, though my blood pressure was higher today than normal. It is always high and has been so for a long time. I have a naturally high blood pressure and my arthritis medicine helps to shoot it up even more. My doctor has prescribed an additional medicine that - if I tolerate it well - should do the trick. Somewhere in the midst of our conversation we were talking about the parishes I pastor. My doctor knows the locations of my parishes and, in reference to my returning to him, said, "You like stability, don't you?" I do indeed like stability, very much. And I have not had much of it lately. In part, I answered him that because I have a rare form of a rare form of arthritis, it makes a great deal of sense to me that once I find a good doctor who understands my history that I should keep him, even if a large distance separates us (one hour and forty-five minutes really isn't too far) because it isn't worth having to explain everything again. He agreed. Certainly, this answer is correct, but my desire for stability certainly also plays into it. His simple question, posed as a humorous aside, set me thinking and pondering (it doesn't take much to do so). And drives at night don't hurt, either. After the appointment, I had the oil changed in my car and took it for a wash before stopping by soccer practice for a bit. All the while my mind was working and memories filled my heart with longing. Today finds me missing my parents, good friends, the ocean breeze, soccer games and practices, the classroom and a whole host of other things. And all the while I longed for heaven. I feel rather melancholic, which some see as something bad. I, though, always greet these feelings warmly, for they bring with them a certain sadness caused by love and the joy of memories past and of a future reunion. There is something safe and comfortable in stability. I learned too young that this world passes away and so, in my own way, I seek to hang on to what can be held. A doctor - and such others - can be held on to, in a sense, and thus some little stability is maintained. It is nights like these that I realize all the more that, in the words of Rich Mullins, "there's a lot of love locked up inside me I'm learning to give." It just takes me a long while to learn how to give it, particularly in new situations and with new groups of people. It takes a great deal of courage to be open enough to let that love, the love of the Lord, be felt and known. It brings with it not stability but vulnerability. Dear altar servers, dear friends, dear German-speaking pilgrims, welcome to Rome! 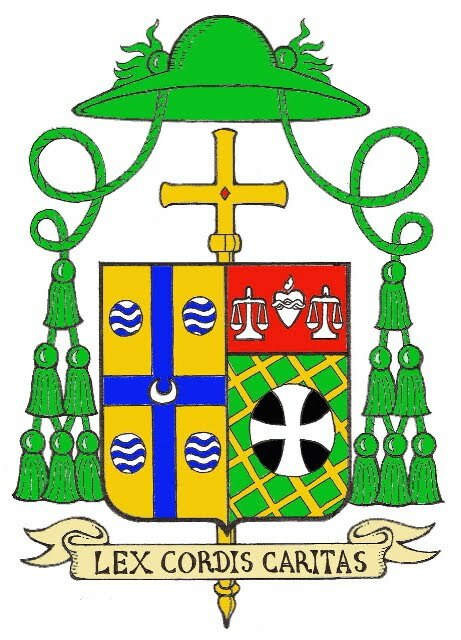 I greet cordially all of you and Cardinal Tarcisio Bertone, Secretary of State. He is called "Tarcisio" like your Patron Saint. You have had the courtesy to invite him and he, who is called Tarcisius after the Saint, is happy to be able to be here among the world's altar servers and the German altar servers. I greet my dear Brothers in the episcopate and in the Priesthood, and the Deacons who have wished to take part in this Audience. I warmly thank Bishop Martin Gächter, Auxiliary of Basel, President of "Coetus Internationalis Ministrantium", for his greeting to me, for the important gift of the statue of St Tarcisius and for the scarf he has given me. It all reminds me of the time when I too was an altar boy [Pope Benedict often includes a personal touch in such addresses]. I also thank Bishop Gächter on your behalf for the great work he carries out among you. I likewise thank your co-workers and all who got together to make this joyful meeting possible. My gratitude also goes to the Swiss sponsors and to all who have worked in their various capacities to make the large statue of St Tarcisius a reality. Who was St Tarcisius? We do not have much information about him. We are dealing with the early centuries of the Church's history or, to be more precise, with the third century. It is said that he was a boy who came regularly to the Catacombs of St Calixtus here in Rome and took his special Christian duties very seriously. He had great love for the Eucharist and various hints lead us to conclude that he was presumably an acolyte, that is, an altar server. Those were years in which the Emperor Valerian was harshly persecuting Christians who were forced to meet secretly in private houses or, at times, also in the Catacombs, to hear the word of God, to pray and to celebrate Holy Mass. Even the custom of taking the Eucharist to prisoners and the sick became increasingly dangerous. One day, when, as was his habit, the priest asked who was prepared to take the Eucharist to the other brothers and sisters who were waiting for it, young Tarcisius stood up and said: "send me!". This boy seemed too young for such a demanding service! "My youth", Tarcisius said, "will be the best shield for the Eucharist". Convinced, the priest entrusted to him the precious Bread, saying: "Tarcisius, remember that a heavenly treasure has been entrusted to your weak hands. Avoid crowded streets and do not forget that holy things must never be thrown to dogs nor pearls to pigs. Will you guard the Sacred Mysteries faithfully and safely?". "I would die", Tarcisio answered with determination, "rather than let go of them". As he went on his way he met some friends who approached him and asked him to join them. As pagans they became suspicious and insistent at his refusal and realized he was clasping something to his breast that he appeared to be protecting. They tried to prize it away from him, but in vain; the struggle became ever fiercer, especially when they realized that Tarcisius was a Christian; They kicked him, they threw stones at him, but he did not surrender. While Tarcisius was dying a Pretoria guard called Quadratus, who had also, secretly, become a Christian, carried him to the priest. Tarcisius was already dead when they arrived but was still clutching to his breast a small linen bag containing the Eucharist. He was buried straight away in the Catacombs of St Calixtus. Pope Damasus had an inscription carved on St Tarcisius' grave; it says that the boy died in 257. The Roman Martyrology fixed the date as 15 August and in the same Martyrology a beautiful oral tradition is also recorded. It claims that the Most Blessed Sacrament was not found on St Tarcisius' body, either in his hands or his clothing. It explains that the consecrated Host which the little Martyr had defended with his life, had become flesh of his flesh thereby forming, together with his body, a single immaculate Host offered to God. Today the Church celebrates one of the most important feasts of the liturgical year dedicated to Mary Most Holy: the Assumption. At the end of her earthly life, Mary was taken in soul and body to heaven, that is, to the glory of eternal life, in full and perfect communion with God. 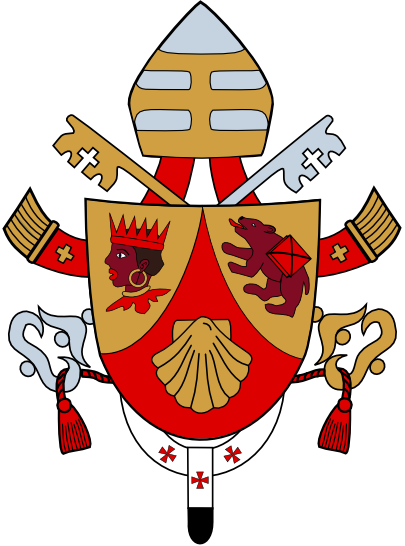 Celebrated this year is the 60th anniversary since the Venerable Pope Pius XII solemnly defined this dogma on Nov. 1, 1950 [somehow I missed that], and I would like to read -- although it is somewhat complicated -- the form of the dogmatization. The Pope says: "Hence the revered Mother of God, from all eternity joined in a hidden way with Jesus Christ in one and the same decree of predestination, immaculate in her conception, a most perfect virgin in her divine motherhood, the noble associate of the divine Redeemer who has won a complete triumph over sin and its consequences, finally obtained, as the supreme culmination of her privileges, that she should be preserved free from the corruption of the tomb and that, like her own Son, having overcome death, she might be taken up body and soul to the glory of heaven where, as Queen, she sits in splendor at the right hand of her Son, the immortal King of the Ages" (Apostolic Constitution "Munificentissimus Deus," 40). This is, hence, the nucleus of our faith in the Assumption: we believe that Mary, as Christ her Son, has already conquered death and triumphs now in heavenly glory in the totality of her being, "in soul and body." St. Paul, in today's second reading, helps us to throw some light on this mystery from the central event of human history and from our faith: that is, the event of the resurrection of Christ, who is "the first fruits of those who have died." Immersed in his Paschal Mystery, we have been made sharers in his victory over sin and death. Herein is the amazing secret and the key reality of the whole of human history. St. Paul tells us that we were all "incorporated" in Adam, the first and old man, we all have the same human inheritance to which he belongs: suffering, death, sin. However to this reality that all of us can see and live every day he adds something new: We are not only in this inheritance of the one human being, begun with Adam, but we are also "incorporated" in the new man, in the Risen Christ, and thus the life of the Resurrection is already present among us. Hence, this first biological "incorporation" is incorporation in death, incorporation that generates death. The second, the new one that is given to us in baptism, is "incorporation" that gives life. I quote again today's Second Letter; St. Paul says: "For since death came through a human being, the resurrection of the dead came also through a human being. For just as in Adam all die, so too in Christ shall all be brought to life, but each one in proper order: Christ the firstfruits; then, at his coming, those who belong to Christ" (1 Corinthians 15:21-24). Now, what St. Paul states about all men, the Church, in her infallible teaching, says of Mary, in a precise way and meaning: the Mother of God is inserted to such a degree in the mystery of Christ that she shares in the resurrection of her Son with her whole being already at the end of her earthly life, she lives what we hope for at the end of time when death, "the last enemy," will be destroyed (cf. 1 Corinthians 15:26); she already lives what we proclaim in the Creed "I look for the resurrection of the dead and the life of the world to come." Hence, we can ask ourselves: What are the roots of this victory over death anticipated miraculously in Mary? The roots are in the faith of the Virgin of Nazareth, as attested in the passage of the Gospel we heard (Luke 1:39-56): a faith that is obedience to the Word of God and total abandonment to divine initiative and action, according to what the archangel announces to her. Faith, hence, is Mary's greatness, as Elizabeth joyfully proclaims: Mary is "blessed among women," "blessed is the fruit of her womb" because she is "the mother of the Lord," because she believes and lives in a unique way the "first" of the beatitudes, the beatitude of faith. Elizabeth confesses it in her joy and that of the child who leaps in her womb: "And blessed is she who believed that there would be a fulfillment of what was spoken to her from the Lord" (vs. 45). Dear friends! Let us not limit ourselves to admire Mary in her glorious destiny, as a person who is far from us: no! We are called to see what the Lord, in his love, also willed for us, for our final destiny: to live through faith in perfect communion of love with him and thus to truly live. In this connection, I would like to pause on an aspect of the dogmatic affirmation, where it speaks of assumption to heavenly glory. All of us are conscious today that with the term "heaven," we do not refer to some place in the universe, to a star or something similar: no. We refer to something much bigger and more difficult to define with our limited human concepts. With this term "heaven," we mean to affirm that God, the God who has made himself close to us, does not abandon us, not even in death and beyond it, but that he has a place for us and he gives us eternity; we want to affirm that there is a place for us in God. To understand this reality somewhat more, let us look at our own life: We all know that when a person dies he continues to subsist in the memory and the heart of those who knew and loved him. We could say that a part of that person continues to live in them, but it is as a "shadow" because this survival in the heart of his loved ones is also destined to end. God instead never passes and all of us exist because of his love. We exist because he loves us, because he has thought of us and called us to life. We exist in the thoughts and love of God. We exist in all our reality, not only in our "shadow." Our serenity, our hope, our peace are founded precisely on this: on God, on his thought and on his love, it is not only a "shadow" of ourselves that survives, but that in him, in his creative love, we are kept and introduced with our whole life, with our whole being into eternity. It is his love that conquers death and gives us eternity, and it is this love that we call "heaven": God is so great that he also has a space for us. And the man Jesus, who is at the same time God, is for us the guarantee that being-man and being-God can exist and live eternally in one another. This means that each one of us will not continue existing only in a part that has been, so to speak, wrenched from us, while the rest is ruined; it means rather that God knows and loves the whole man, what we are. And God receives in his eternity what now, in our life, made up of suffering and love, of hope, of joy and sadness, grows and comes to be. The whole man, the whole of his life is taken by God and, purified in him, receives eternity. Dear friends! I think this is a truth that should fill us with joy. Christianity does not proclaim merely a certain salvation of the soul in some imprecise place beyond, in which everything in this world that was precious and loved by us is erased, but it promises eternal life, "the life of the world to come": Nothing of what is precious and loved will be ruined, but will find its fulfillment in God. All the hairs of our head are numbered, Jesus said one day (cf. Matthew 10:30). The final world will also be the fulfillment of this earth, as St. Paul states: "creation itself would be set free from slavery to corruption and share in the glorious freedom of the children of God" (Romans 8:21). Understood therefore is that Christianity gives strong hope in a luminous future and opens the way to the realization of this future. We are called, precisely as Christians, to build this new world, to work so that it will become one day the "world of God," a world that will surpass everything that we ourselves could build. In Mary assumed into heaven, fully sharing in the resurrection of her Son, we contemplate the realization of the human creature according to the "world of God." Let us pray to the Lord to make us understand how precious our life is in his eyes; may he reinforce our faith in eternal life; may he make us people of hope, who work to build a world open to God, people full of joy who are able to perceive the beauty of the future world in the midst of the cares of daily life and, with this certainty, live, believe and hope. Without explanation and much to my surprise, went I exited the church this morning after celebrating Mass, I paused on the steps for a moment and said, both to myself and aloud, "Tut, tut, it feels like rain." Naturally, my mind immediately raced back to childhood when Christopher Robin said, at Pooh's request, "Tut, tut, it looks like rain." Now, near the close of day, it still feels like rain. If only it would pour. Capello tip to Matthew Archbold. I'm all for bringing your small children to church, but please make them leave their plastic hammers in the car! Will God, who demands that we take up our crosses and follow after him, really be pleased with such a thought? Does not the One who gave himself entirely to us, holding nothing back, not desire - and deserve - the same from us? In the end, it comes down to the depth of our love, both our love of God and our love of neighbor. Such love is demonstrated by the manner of our clothing and by our behavior in a church. Clothes say something about what we think, what we value. They also influence how we behave and feel. That our culture has become so casual about everything says something about us. I cannot exactly articulate it but it seems to say, “nothing is really all that important.” But that is not true. Going to God’s house IS important. Being ministered to by the King of Kings and Lord of Lords is astounding. Casual attire in these circumstances is simply inappropriate if we really think about what we are doing, where we are going and who it is we will meet. It does not necessarily follow that we must wear tuxedos and formal gowns. But decent semi-formal attire seems wholly appropriate. Sunday is special, God’s House is special. Some things really ARE important and our clothing and demeanor ought to reflect this truth. When considering what to wear to Mass, we ought not to wear what we might also wear to bed or to the beach; the old maxim of our “Sunday best” should still guide what we wear. Some will argue that they cannot dress up a little for Mass because they must go to work immediately after, or that they are going to a sporting event or a picnic or some other such thing. While they may indeed be going off to such and such a place, this is not a good reason not to dress appropriately for the Holy Mass. There are restrooms in our churches and halls that may be used for changing if need be and most every destination also has a restroom we can change in. The Holy Mass is not about our convenience, but about the worship of God. In every celebration of the Eucharist we encounter the King of kings and the Lord of lords. Let our clothing and demeanor reflect this reality. If we dress modestly and with some dignity, if we act respectfully and quietly, we give honor to God and do not cause a distraction to the prayer of others. I wish also to remind parents of young children that if toys are brought to Mass to keep the attention of little ones, that quiet toys should be brought; toys that make noise – such as trucks and cars –can distract the prayer of others. Also, if snacks must be brought, please be certain to pick up what your child drops in honor of the dignity of the house of the Lord. Let each of us, then, seek not to distract others from a moment of quiet and humble prayer as we seek to approach the Lord always in reverence and in love. Thankfully, no pounding of hammers prompted my words. The second full weekend in August marks the annual picnic of St. Anthony of Padua Parish in Effingham, where I formerly was Parochial Vicar. The Saturday morning before the picnic now marks the annual Bulldog Challenge, held in memory of Colin Woods. Friday evening I returned to Effingham to participate in the 5K walk side of the Bulldog Challenge, and to visit a soccer practice (the team is looking good this year). Though it was a very warm morning, the Bulldog Challenge was - as always - a most enjoyable event. Each year since its inception it has grown and this year saw some 400+ runners and walkers. After celebrating the Vigil Mass of the Solemnity of the Assumption of the Blessed Virgin Mary, I joined about fifteen of my brother priests and Bishop Paprocki in Riverton for a dinner held to welcome to new pastors in the Springfield deanery. It was a relaxing way to end the day and a fitting way to honor this weekend's great liturgical feast. It was also at the dinner that I received a friendly scolding or sorts to resume regular blogging. That, hopefully, will resume this week. I'm nearly settled into my new rectory and office and things are beginning to quiet down a bit. ...when the dog won't cross the threshold. Today has been a quiet day here in the rectory, both puppy and pastor being rather tired. As to why the puppy is tired, I cannot say; she slept most of the day yesterday and all through the night. I suspect she's in another growing spurt; she now weighs 44.3 pounds, if I remember correctly from last evening's visit to the veterinarian. I am likely tired because of the heat and exceptionally high humidity; my joints are very much ready for a good, strong and long storm. If it had the White Sword, the shirt would be stupendous. Two weeks ago, a meeting was held in Carlinville of the various directors of Catholic cemeteries throughout the Diocese of Springfield in Illinois. We met to discuss the Cemetery Oversight Act (HB 1188), signed into law by Governor Pat Quinn in March. The 150-page legislation was written in response to the tragic situation of Burr Oak cemetery in Alsip, Illinois, where the remains of the deceased were treated with little dignity or respect. This deplorable situation has also recently come to light at Arlington National Cemetery. The citizens of Illinois have a compelling interest in the expectation that their loved ones will be treated with the same dignity and respect in death, as they are entitled to be treated in life. The laws of the State should provide adequate protection in upholding the sanctity of the handling and disposition of human remains and the preservation of final resting places (emphasis mine). That such legislation is needed at all is, to say the least, very sad indeed. For many of us, such disrespectful treatment of the bodies and remains of those who have died is beyond understanding. It is our certain hope in the promise of the resurrection from the dead on the Last Day that makes such actions incomprehensible. The Catechism of the Catholic Church reminds us: “The bodies of the dead must be treated with respect and charity, in faith and hope of the Resurrection. The burial of the dead is a corporal work of mercy; it honors the children of God, who are temples of the Holy Spirit” (2300). From the beginning of the Church, the Christian faithful have always honored the bodies of their beloved dead and treated them with profound reverence. There is a glimmer of hope in this piece of Illinois legislation that enshrines in law the “sanctity” of the bodies and remains of the dead. If our legislators recognize now the dignity of the dead, what is keeping them from recognizing the full dignity of the living, including those yet to be born? Let each of us increase our prayer and fasting for the respect for life from the moment of conception to the moment of natural death. And let us also continue to pray for those who have gone before us in faith. Thomas Peters passes on the happy news that Representatives Chris Smith (R-NJ) and Dan Lipinski (D-IL) have introduced H.R. 5939, the No Taxpayer Funding of Abortion Act. Having moved just seven miles north from Virden to Auburn, I am now in a new district. When I lived in Effingham, the Honorable John Shimkus was my representative and now I am happy to learn that - thanks to the wonders of mapping policies - I am once again in his district. I had the pleasure of speaking with him on a few occassions over the years. When I mentioned to him one day at a park that I would be moving from his district, he suspected I would not be happy with the voting record of my representative. I was not. I am glad to be once again represented by a man who recognizes the value and dignity of babies not yet born. And one who is a sponsor of H.R. 5939. Some days ago, Speaker of the House Nancy Pelosi said her favorite word - apparently people often ask her about her favorite word - was "the Word," as in the Word made flesh. I know: it's cheesy. And more than one word. Speaker Pelosi went on to say, "we have to give voice to what that means in terms of public policy that would be in keeping with the values of the Word. The Word. Isn’t it a beautiful word when you think of it? It just covers everything. The Word." Recently the Catholic News Service asked the Speaker when the Word was made flesh, whether at the Annunciation or at the Nativity. She responded thus: "Whenever it was we bow our heads when we talk about it in church, and that’s where I’d like to talk about that." So much for public policy reflecting the values of the Word. As if this weren't bad enough, she is not even correct at what we do at that moment of the Creed. We do not bow our heads at the words, "By the power of the Holy Spirit...;" we are to make a profound bow - from the waist - at these words. Last evening's concert of Libera at the Cathedral Basilica of St. Louis marked the last of the Cathedral Concerts under the guidance of Dr. John Romeri, who memborably described Libera as "not your mother's boys choir." The concert was, to say the least, memorable, moving and most enjoyable. To hear the beautiful harmony of the boys and to see the enthusiasm and joy with which they sing was a great delight. There are some forty boys in the choir school and twenty-two of them were present for the concert. Afterwards they signed CDs and programs and chatted with their audience. All in all, it was a magnificent evening and well worth the four hours of sleep I had last night after my return trip to Auburn. Sadly, photography was not permitted during the concert, but I did manage to take a picture of some of the boys at their table as they signed various items. My camera isn't handy at the moment, but I'll try to post that later for you. Today we are presented in the sacred readings with two important topics for our consideration: death and the use of earthly riches. Both of these topics often make us uncomfortable; the first, because we do not want to die, though, curiously, we also do not want to live this life forever, and the second, because we do not often want to examine honestly our use of money. should be the careful consideration of wise people, that since the days of this life are short and the time uncertain, death should never be unexpected for those who are to die. Those who know that they are mortal should not come to an unprepared end (Saint Leo the Great, Sermon 90.4.1. In Ancient Christian Commentary on Scripture, New Testament Vol. III: Luke (Downers Grove, Illinois: Inter Varsity Press, 2003), 208.). Though we know that each of us will indeed die, none of us can know when that day will come; we do not know when we may hear these words: “You fool, this night your life will be demanded of you” (Luke 12:20). None of us likes to be called a fool, even if we are, in fact, quite foolish. This is why these words of the Lord sting so. How, then, do we avoid hearing these words, “You fool”? We do so by being foolish in the eyes of the world but wise in the sight of God. That rich man in the parable of Jesus thought he was wise. Certainly he was successful, at least in terms of earthly estimation. He said to himself, “You have so many good things stored up for many years, rest, eat, drink, be merry” (Luke 12:19)! This life on which he had decided for himself - a life of comfort, luxury and ease – is what the world tells us will bring us happiness, yet we can easily see that those who have attained it are not any happier than the poorest among us. Their minds are occupied with keeping their wealth and they are worried about keeping their status and fame. All of this wears on the mind and heart and many come to ask themselves, “For what profit comes to man from all the toil and anxiety of heart with which he has labored under the sun” (Ecclesiastes 2:22)? Surrounded by his many possessions and wealth, the rich man begins to ask the question which so many of the poor ask: “What shall I do” (Luke 12:17)? He asked the question to decide what to do with his wealth; the poor ask the question to decide how to acquire at least some wealth. There in his palace in the midst of what he has amassed through the sweat of his brow and the labor of others, the man sought happiness in his riches. He does not look to the future. He does not raise his eyes to God. He does not count it worth his while to gain for the mind those treasures that are above in heaven. He does not cherish love for the poor or desire the esteem it gains. He does not sympathize with suffering. It gives him no pain nor awakens his pity. Still more irrational, he settles for himself the length of his life, as if he would also reap this from the ground(Cyril of Alexandria, Commentary on Luke, Homily 89. In Ancient Christian Commentary on Scripture, New Testament Vol. III: Luke (Downers Grove, Illinois: Inter Varsity Press, 2003), 207.). This man ignored the wisdom of the Psalmist, who sang to the Lord: “You make an end of them in their sleep; the next morning they are like the changing grass, which at dawn springs up anew, but by evening wilts and fades” (Psalm 90:5-6). Consequently, his riches bring him little happiness, neither on earth nor in the life yet to come; he stored up plenty of treasures on earth, but stored up little in heaven (cf. Luke 12:21). This silly fool of a man did not have that kind of riches. Obviously he was not redeeming his soul by giving relief to the poor. He was hoarding perishable crops. I repeat, he was hoarding perishable crops, while he was on the point of perishing because he had handed out nothing to the Lord before whom he was to appear. How will he know where to look, when at that trial he starts hearing the words “I was hungry and you did not give me to eat”? He was planning to fill his soul with excessive and unnecessary feasting and was proudly disregarding all those empty bellies of the poor. He did not realize that the bellies of the poor were much safer storerooms than his barns. What he was stowing away in those barns was perhaps even then being stolen away by thieves. But if he stowed it away in the bellies of the poor, it would of course be digested on earth, but in heaven it would be kept all the more safely. The redemption of a man’s soul is his riches (Saint Augustine of Hippo, Sermon 36.9. In Ancient Christian Commentary on Scripture New Testament Vol. III: Luke, Thomas C. Oden, et al, eds (Downers Grove, Illinois: Inter Varsity Press, 2000) 208.). Here, then, we arrive at the second lesson for our consideration, the use of earthly riches. We must remember what Saint Paul says to Saint Timothy, that “the love of money is the root of all evils, and some people in their desire for it have strayed from the faith and have pierced themselves with many pains” (I Timothy 6:10). It is greed that leads man astray, a greed whose roots lie in pride, in an excessive focus on the self. Those who are poor should thank the Lord for sharing in his poverty and not seek to amass worldly wealth for its own sake. Those who are rich should thank the Lord for their material blessings and seek to give their riches away in imitation of the Lord who gave all he had for us. Those who are rich will have great difficulty entering the kingdom of heaven unless they give their wealth away – which is a sign of their detachment from it – and store up treasures in the bellies of the poor. There is only one thing, one person, to which each of us should be attached: Jesus Christ. For this reason Saint Paul reminds us to “think of what is above, not of what is on earth” and to “put to death, then, the parts of you that are earthly” (Colossians 3:5). It is so very often our earthly desires that keep us from the Lord because we often confuse these desires with our desire for the Lord. Our deepest longings cannot be fulfilled now, but only on the Day of Judgment when we will stand before the Lord Jesus Christ, when those who are truly wise will hear him say, “Well done, my good and faithful servant… Come, share your master’s joy” (Matthew 25:21). What, then, are we to do with the desires we have now for earthly things? We must recognize them for what they are: intimations of our longing for God. So now is the time for groaning, then for embracing. What we desire now is not present; but let us not falter in desire; let long, continuous desire be our daily exercise, because the one who made the promise doesn’t cheat us (Saint Augustine of Hippo, Sermons 350 A.4. In Ancient Christian Commentary on Scripture New Testament Vol. IX: Colossians, 1-2 Thessalonians, 1-2 Timothy, Titus, Philemon, Thomas C. Oden, et al, eds (Downers Grove, Illinois: Inter Varsity Press, 2000) 47). Those who are truly wise know that they will die and that they will take nothing from this world with them. They know that they will cross the threshold of death “emptied of all but clothed in Christ” (Pope Benedict XVI, Homily, 4 November 2006). Today we come to the altar of God to be nourished by the Body and Blood of the Eucharistic Lord. We know that whoever receives Holy Communion worthily and well-disposed and open to the fruits of the Sacrament “loses himself in God, as a drop of water in the ocean. They can be no more separated” (Saint John Vianney, in Mike Aquilina, Fire of God’s Love: 120 Reflections on the Eucharist (Cincinnati, Ohio: Servant Books, 2009), 52). Let us, then, beg the Lord this day to “teach us to number our days aright, that we may gain wisdom of heart” (Psalm 90:12). Let us ask for the grace to be aware of our death that we might be wise in Christ and live this day well. Amen.